We’d love your help. 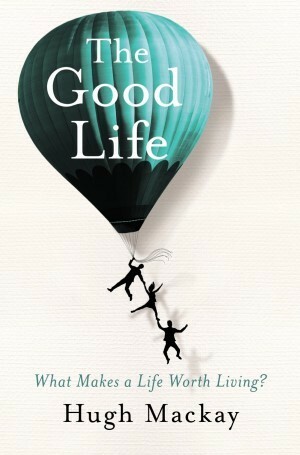 Let us know what’s wrong with this preview of The Good Life by Hugh Mackay. "No one can promise you that a life lived for others will bring you a deep sense of satisfaction, but it's certain that nothing else will." His conclusion is pr "No one can promise you that a life lived for others will bring you a deep sense of satisfaction, but it's certain that nothing else will." To ask other readers questions about The Good Life, please sign up. This is a thought-provoking book about, as Hugh Mackay puts it in the introduction, 'a morally praiseworthy life...a life devoted to the common good.' Initially I thought that sounded rather bland and unexciting, pious even, but as the book developed, I found it wasn't the case at all. The author makes several important points about modern society, particularly regarding the 'Utopia complex' - the self-indulgent search for happiness which often makes people more miserable, and how the emphasis o This is a thought-provoking book about, as Hugh Mackay puts it in the introduction, 'a morally praiseworthy life...a life devoted to the common good.' Initially I thought that sounded rather bland and unexciting, pious even, but as the book developed, I found it wasn't the case at all. The author makes several important points about modern society, particularly regarding the 'Utopia complex' - the self-indulgent search for happiness which often makes people more miserable, and how the emphasis on developing self-esteem in children at the expense of reality and common sense is resulting in an attitude of entitlement and lack of resilience in the coming generation. The premise on which the book is based - that the most satisfaction will be gained from a life that's lived for others rather than yourself - is not new, but the author comes to this conclusion only after detailed discussion on alternative points of view, old and new philosophies and lifestyles and the myriad paths we can go down to find happiness and peace of mind. Insightful, well researched and challenging. Just read first chapter and thoroughly enjoying his analysis of the Utopia Complex. There are a lot of how truths here I would like to see kids reading this because it might set them on a better path. It is eminently readable thought at sometimes labored. I mostly got the importance of selflessness and not expecting something in return for whatever kindness you give. The idea of everyone wanting to be taken seriously was enlightening, as was the distinction between 'active listening' and merely 'hearing someone out'. I also really enjoyed reading the anecdotes dotted throughout the book, that applied the ideas that Mackay was explaining about. I found insights in this book, but like many in this genre, there is always another that may say something different. But I did look forward to reading the anecdotes in every chapter. Hugh Mackay defines the good life as one lived for others - "defined by our capacity for selflessness, the quality of our relationships and out willingness to connect with others in a useful way." Mackay suggests that our focus on ourselves, the misplaced importance on accumulating money and possessions is leading us into a misguided idea of a good life. He has no problem with money and possessions - just the use of them to measure our worth. Instead he suggests that a truly good life is lead if y Hugh Mackay defines the good life as one lived for others - "defined by our capacity for selflessness, the quality of our relationships and out willingness to connect with others in a useful way." Instead he suggests that a truly good life is lead if you follow the golden rule - do to others as you would have them do to you. (Interesting point - this rule or a version of it has been around a lot longer than it's religious connotations. All ancient civilizations has a variation on the theme...) Something that is not as easy as it sounds. It is one of the best book I have read so far. The good life is all about sharing and giving rather then taking and boasting about yourself. Cheers & thanks for wonderful thoughts. Thought-provoking on both a personal and professional level. Like all his books, I will return to this at times as he has such an insightful style. He is often able to give words to something that has only been a nebulous concept for me. A great book on what I'd think of as practical philosophy in that it allows a simpleton like myself to understand how I can live a life o purpose. One that is good and allows me to know what good is. This book examines the notion of happiness or satisfaction in our lives. The conclusion is that happiness ultimately lies not in what we can get our ourselves but in our relationships with others. A thought provoking book about how to live a life of meaning rather than striving for happiness. It was a slow read for me but it did provoke lots of dinner time discussion. I had the same problems with this book as I had when studying Maslow's 'Heirarchy of Needs' - a very white, middle-class male's idealization of how to live 'life'. Very superficial and certainly not very political. I'm giving this book 5 stars on the basis that I was constantly recommending it to people and writing down quotes that I wanted to hold on to. On that basis I consider it deserving of 5 stars. In a way it was a tough read, as it pulled me up on my self indulgent and self absorbed tendencies. It also posits that happiness is not the be all we should be aiming for, or even skewed towards, criticising for example the suggestion that we should list things we should be grateful for every day. Instead I'm giving this book 5 stars on the basis that I was constantly recommending it to people and writing down quotes that I wanted to hold on to. On that basis I consider it deserving of 5 stars. In a way it was a tough read, as it pulled me up on my self indulgent and self absorbed tendencies. It also posits that happiness is not the be all we should be aiming for, or even skewed towards, criticising for example the suggestion that we should list things we should be grateful for every day. Instead, the good life is a whole life, with value in all emotions, and our focus should be on kindness and contributing to the wellbeing of others. Here are some of the quotes I particularly enjoyed. Intelligence – “People who experience the joy of participation in the creative arts don’t need superior intelligence; nor do those who enjoy the richness of their emotional response to music, movies or well-played sport, or those who offer loving care and support to their families and friends, and to people in need who happen to lie beyond their social circle. No, intelligence is not the place to look if you’re trying to decipher the codes of human behaviour: it is neither interesting nor significant as a discriminator of anything except people’s ability to perform particular tasks… The thing to strive for – the thing to nurture in our children – is not only the maximising of our intellectual potential, but the maximising of our potential for goodness.” p105. Leadership (in discussing corruption of power/fame) “This has nothing to do with the fact that every society, every community, every organisation needs its leaders – people who are prepared to take on the mantle of responsibility for others’ wellbeing; people capable of inspiring and encouraging others to become the best they can be. Self-sacrificial leadership is a social good, and leaders deserve our respect and gratitude for taking on that onerous role.” P110. Teaching – “She was a natural teacher – warm, intelligent, creative, meticulous – but there was something more. She empowered children by believing in them so they came to believe in themselves. She set high standards of behaviour – old-fashioned courtesy, respect for others…Her life – one of integrity, faith, humour, kindness and courage – is a reminder that depth counts as much as breadth.” P114. Einstein quote “Try not to become a man of success, but rather a man of value” P114. Love – “Love, in all its many manifestations – kindness, care, compassion, generosity, tolerance, encouragement, support – is the source of everything we admire and appreciate most in human behaviour” P128. “If love is the ultimate source of goodness in our lives, it follows that the good life is primarily about others” P128. Good life, putting convictions into practice – “How would you actually live by the so-called Golden Rule, even if you really wanted to? ‘Do unto others as you would have others do unto you’? It sounds like the recipe for a good life, but how in practice do you stifle your perfectly natural urges towards greed, ambition, competitiveness or revenge, the very things likely to leach goodness out of your life? How do you shed grudges you actually enjoy carrying? How do you find the emotional wherewithal to forgive someone who’s wronged you? How do you let go of stuff you’ve done in the past?” p 129-130. “The good life is not about being smart, rich, famous or sure of yourself…The whole idea of a good life will evaporate if we focus on ourselves and what we’re getting out of it. In particular, if we allow ourselves to become preoccupied with how we’re feeling about our life, whether we’re up or down on particular days or whether people are treating us well or badly in a particular situation, we may lose sight of what goodness really is. Self-absorption is not a recognised pathway to goodness, let alone to enlightenment or fulfilment.”p157-158. Morality – recognise, respect and respond to each other’s rights and needs. “In practice, it’s about the strong supporting the weak, the haves sharing their prosperity with the have nots, the able offering guidance and support to the less able.”p159. “Morality doesn’t ask questions about whether the poor or needy deserve our support. People who are sick, distressed, or disabled in some way don’t need to justify their appeal for our help: their situation is its own justification. The mere existence of a need defines our moral duty. Refugees need a home…” p159. “Morality is like a blueprint for managing our relationships with those we love and those we don’t – especially those we don’t, since it’s easy to respond well to those we love.” P160. High Mackay really is one of the great Australians, isn't he? He writes so clearly and empathetically on the human condition. That said, I suspect that if I hadn't been meaning to read this book for so long, I would have enjoyed it a lot more and got more out of the earlier chapters. As it was, it was really the final chapters that made it the important book it is, for me. Most particularly, the chapter on A Good Death was very moving and fascinatingly thought through. Mackay's own encapsulation High Mackay really is one of the great Australians, isn't he? He writes so clearly and empathetically on the human condition. That said, I suspect that if I hadn't been meaning to read this book for so long, I would have enjoyed it a lot more and got more out of the earlier chapters. As it was, it was really the final chapters that made it the important book it is, for me. Most particularly, the chapter on A Good Death was very moving and fascinatingly thought through. Mackay's own encapsulation of the Golden Rule is one of the most thought-provoking I've come across: "'Who am I?' turns out to be a less interesting and less significant question that 'Who are we?'" "As a species, we humans thrive when we live cooperatively in communities, but the stability of those communities is not guaranteed; nor is the maintenance of peace between one community and another. We are both cooperators and competitors; we are both selfless and selfish. How we reconcile those two sides of our nature determines the kind of society we become. It's not a question of survival of the fittest; ultimately it's a question of survival of the species." In a sense I felt at home in this book because Hugh gives an experienced and authoritative voice to thoughts that are intuitive to many people, but which are usually swamped by the promises of a world obsessed with material progress. I can't help thinking that this is a terribly important book, for several reasons. First, Hugh has been a long-time expert observer and researcher whose work has been rooted in the understandings and expectations of everyday people of all beliefs (or lack of them). In a sense I felt at home in this book because Hugh gives an experienced and authoritative voice to thoughts that are intuitive to many people, but which are usually swamped by the promises of a world obsessed with material progress. First, Hugh has been a long-time expert observer and researcher whose work has been rooted in the understandings and expectations of everyday people of all beliefs (or lack of them). Second, he is able to place our apparent needs into the context of the universal, without them having to conform to particular dogma traditions. And third (but there are others if a longer review was being written) he provides a framework for the restraint of our behaviour in a time when our expectations continue to rise as our community wealth increases, instead of being met, or satisfied by that increased wealth. This is a book that makes clear what it means to truly live the good life. Mackay writes in an engaging and thought-provoking style. Mackay starts by questioning what we believe to be a "good life" and then takes us through the points one by one and explains why they may not entirely be the right reasons. Unlike other books of this nature, Mackay doesn't preach like he is some faultless person lecturing us mere mortals. Rather, he speaks with the voice of a guidance counselor who is instructing This is a book that makes clear what it means to truly live the good life. Mackay writes in an engaging and thought-provoking style. Unlike other books of this nature, Mackay doesn't preach like he is some faultless person lecturing us mere mortals. Rather, he speaks with the voice of a guidance counselor who is instructing us without spoon-feeding us. You will probably pause after his chapter and contemplate his words. I read this book as part of Modern Mrs Darcy's 2016 Reading Challenge, as 'A book chosen for you by your spouse'. While I liked most of the points he made and found inspiration in it, I thought he took a long time to say everything and the book could have been half the size, more concise and been more enjoyable to read. Basically his message is: The good life is not an easy life, or a happy life, or a prosperous life. The good life is dedicated to being and doing good for others. Definitely somethi I read this book as part of Modern Mrs Darcy's 2016 Reading Challenge, as 'A book chosen for you by your spouse'. I really enjoyed reading The Good Life, probably because it helped me understand my own thought processes and motivations a little better. I particularly liked Mackay's appraisal of some of our most frequently espoused platitudes - often lost in translation. I will definitely keep this book on my shelf as a reminder of what makes life good. 'The good life is one lived for others.' This book shines a light on current society and our continual search for happiness. It is an inspiring book to help us live a better life, one for others. One of the guiding questions that particularly resonated with me was, 'Is this the right thing to do?' Well worth reading if you're interested in adding more meaning to your life. A thought-provoking novel about different life values and how they contribute to your quality of life. Mackay leaves room you to disagree with his ideas, but is mostly hard to disagree with. He expresses his thoughts beautifully and arrives at sensible and satisfying conclusions. Good if you're up for something a bit philosophical. This is a book that everyone should read at least once during their lifetime. It reminds us of how we should interact with one another by utilizing the message of the Golden Rule. In our fast paced, selfish and materialistic society Hugh's message brings us all back down to earth with a thud! I'll be handing it around to members of my family to read. Hugh Mackay is a social researcher and novelist who has made a lifelong study of the attitudes and behaviour of Australians. He is the author of twelve books, including five bestsellers. The second edition of his latest non-fiction book, Advance Australia…Where? was published in September 2008, and his fifth novel, Ways of Escape was published in May 2009. He is a fellow of the Australian Psycholog Hugh Mackay is a social researcher and novelist who has made a lifelong study of the attitudes and behaviour of Australians. He is the author of twelve books, including five bestsellers. The second edition of his latest non-fiction book, Advance Australia…Where? was published in September 2008, and his fifth novel, Ways of Escape was published in May 2009. He is a fellow of the Australian Psychological Society and received the University of Sydney’s 2004 Alumni Award for community service. In recognition of his pioneering work in social research, Hugh has been awarded honorary doctorates by Charles Sturt, Macquarie and NSW universities. He is a former deputy chairman of the Australia Council, a former chairman of trustees of Sydney Grammar School, and was the inaugural chairman of the ACT government’s Community Inclusion Board. He was a newspaper columnist for almost 30 years and now writes occasionally for The Sydney Morning Herald, The Age and The West Australian. He is a frequent guest on ABC radio.